A jury is a sworn body of people convened to render an impartial verdict officially submitted to them by a court, or to set a penalty or judgment. Modern juries tend to be found in courts to ascertain the guilt or lack thereof in a crime. In Anglophone jurisdictions, the verdict may be guilty or not guilty. 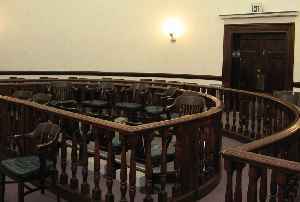 The old institution of grand juries still exists in some places, particularly the United States, to investigate whether enough evidence of a crime exists to bring someone to trial.